"That's the entrance to a wormhole that runs between worlds. When you step inside, you slide through to another universe, completely distinct and separate from your own." I've been known to carry longstanding grudges against brainless networks for screwing with shows that I really like, and for some reason Fox is always one of the major culprits. 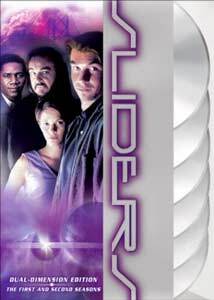 I don't watch all that much television, but I can rattle off their sloppy handling of programs like Futurama, Millennium and Wonderfalls right off the top of my head, and the alternate universe realities of Sliders is another classic example. Their nitpicking and handholding watered down the series quite a bit, forcing the Sci-Fi Channel (another bastion of horrendous programming) to glom onto the waning glory days, and in the end leave nothing but a really bitter taste in the mouths of the faithful. To sate and placate fans (and perhaps pretend that shoddy later seasons maybe just never happened) Universal has uncorked with a wonderful six-disc collection of the first and second seasons of Sliders, something that most followers would consider the series' high water mark. The two-hour pilot, an ep that more than stands on its own, is as fine a bit of sci-fi themed television as I've seen in recent years, even with the absences of spaceships and aliens. The premise is custom made for episodic television: Quinn (Jerry O'Connell), a brainy San Francisco physics student, has perfected a device—in his mom's basement, no less—that opens up a temporary wormhole between alternate Earths. By leaping into the wormhole, one can "slide" between worlds; but of course there's a catch, which is the foundation of the show's appeal. It seems there's no way to return back from whence you came, so Quinn, along with his college professor Maximillian Arturo (John Rhys-Davies), gal pal Wade (Sabrina Lloyd), and, through an odd turn of events, fading R&B singer Rembrandt "Crying Man" Brown (Cleavant Derricks), are left to slide from alternate world to alternate world each week, finding themselves in some very strange places. This isn't an overly nerdy hard-science series, but rather more of a "what if" show, that over the course of the 23 episodes of these first two seasons, weekly finds the characters sliding into an assortment of parallel worlds for a brief time, before launching themselves down a wormhole just before the closing credits. What if the Americans lost to the British during in 1776, what if the atomic bomb was never invented, what if modern medicine never discovered penicillin—those are some of the scenarios Quinn, Arturo, Wade, and Crying Man find themselves in; once you get past the illogically convenient plot reliance on having one of the main characters just happening to be a key character in the alternate world (or one of their friends), you can focus on the fact that the writing is generally a whole lot smarter than a tired sitcom or tedious drama. One of the show's real strengths is Rhys-Davies, who, whether as a companion to Indiana Jones or as an axe-wielding dwarf in The Lord of the Rings, shows here that he has the right amount of frustrated, deep-voiced pomposity that serves as the foundation that holds the quartet of main characters together. O'Connell is anonymously likeable, Lloyd is stiffly cute, and Derricks' Crying Man Brown may get all the genuinely broad laughs, but Rhys-Davies has a delivery that gives the show something approaching legitimacy, if for nothing other than his booming and distinctive speaking voice, which makes even the most tired exasperation sound engaging. I have a 13-year-old daughter who, if I may play proud dad for a moment, recently took a gold medal in our state science fair. She's a brainy kid, and I only mention this because she was just a toddler when the show first ran, and while watching this release she now considers this one of "the coolest shows" she's ever seen. The fact that she found the episode where smart people are as revered as world-class athletes made me realize there was probably a broader appeal to this show than I originally might have imagined. The "what if" scenarios and scientific anomalies of Sliders are right up her alley, and for me, watching these shows again I get the chance to sort of see it through a new pair of eyes. This isn't revolutionary television by any means, but it is incessantly clever when it is on its game, which is more often than not, and even at its worse it is still adventurous. Image Transfer Review: All eps are presented in their original 1.33:1 aspect ratio. The transfers fall on the good side of decent, looking extremely presentable. Colors are fairly bright, and the transfers hold up extremely well during brightly lit sequences, but the black levels are really not so hot, turning many dimly lit interior scenes noticeably muddy. The occasional white speck crops up sporadically, but that's about it in terms of major detritus. Audio Transfer Review: While far from being a showcase for your home theater, the 2.0 surround presentation is nicely put together, preserving the series in a mix that delivers a generally clean blend of dialogue. It's not altogether perfect, however, with the only real weak spots occurring during some of the more action packed sequences, in which case dialogue tends to get buried slightly. Rear channels get used more frequently than I would have expected, and I always take that as a plus. Extras Review: Let's start with the spiffy if impractical packaging from Universal on this release. The six discs appear to hover in the clear plastic case, but in reality they're stuck in a bit of grey foam. It's an eye-catching presentation, though I experienced some problems getting some of the discs out without doing a some crazy gyrations to not smudge or scratch them. There's actually not much here in terms of extras, which is a shame considering the fanbase of the series, with Disc 1 containing a commentary track from co-creators Tracy Torme and Robert K. Weiss on the two-hour pilot episode. They promise to deliver the "inside stories of what went down", and in between singing the theme to Petticoat Junction, we're informed about their demo reels, finding doubles, shooting in Vancouver, and most pleasing, the small inside jokes sprinkled throughout the series. Torme and Weiss have a casual rapport, and even with a few silent gaps, this is easy, enjoyable track. A brief featurette entitled The Making of Sliders (14m:09s) shows up on Disc 6, and sports comments from Torme, Weiss, Jerry O'Connell, and Cleavant Derricks, sandwiched in between clips from the show. This woefully short piece gives a neat snapshot of the show's origins, and how Torme once read that George Washington was almost shot dead prior to the American Revolution. Disc 6 also contains a brief photo gallery. Each ep is cut into four chapters (including the double-length pilot), with optional subtitles in English, French, or Spanish. You can forget the subsequent seasons of Sliders when the show began to tank, cast members left, and ultimately nothing was left but the name. These first two seasons are a treat, representing the zenith of the series, and though ripe with minor inconsistencies and the general limitations of episodic network television, still make for the kind of inventive programming that wasn't constrained by the usual doses of hackneyed predictability.